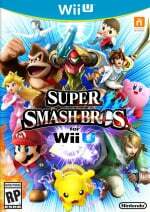 North American gamers are now less than a month away from enjoying Super Smash Bros. for Wii U, the hotly anticipated fourth home console entry in the brawling series. While it hits that region on 21st November, European gamers thought they'd have to wait an additional torturous two weeks; thankfully there's been a change of plan. Nintendo of Europe has confirmed that the latest Smash Bros. will now arrive in Europe one week earlier on 28th November, now just seven days after the North American release. The title's still slated for Japan on 6th December, making the releases neatly staggered at weakly intervals. One theory for the delay is with the online servers, as Nintendo potentially wanted to avoid all fans jumping online at once and potentially prompting server crashes. Whatever the case, it's happy news for European Wii U owners. Are you pleased with this change in release date? Let us know. That's the same day as my birthday! Well that's good but i'm still not getting the game before december. Japan getting a game this large last? Wow, that's pretty surprising to me, at least we can destroy them on day one of online. @arronishere Really? That's pretty cool. Just checked Nintendo Australia and NZ twitter and facebook. This is happening there as well! ...which makes the bundle more odd because for the EXACT SAME PRICE you could order both separately and get both on November 28th, LOL! Now please move Captain Toad to December! If theres one game which can go toe to toe with the so called big boys, this is it. Get Smash in there, show em all who's boss. I live in the states, so it doesn't apply to me, but I'm really happy for you all! I'll be getting Alpha Sapphire instead. Still great news for those getting Smash Wii U on day one! Makes sense as that's when the Amiibos get released. Just preprder every single Amiibo except the Mario one which comes with the smash bros game I preordered. "You know how we said Super #SmashBros. for #WiiU would arrive in December in Europe? Change of plan: Q1 2015 "
This is really cool! Kudos to Nintendo for all the hard work on this game, especially Sakurai and team. A whole week earlier? Whoopdy flamin' doo. It's expensive enough for me to get both games and now smash is out the same day too. I was going to get smash on release day but looks like I will have to get it on it's original launch date. Europe isn't getting screwed! It's a miracle! @Ravravine You and me both, man. Looks like I'm skipping Pokémon for one month later, I don't nearly earn enough to buy three games full price at launch. Yay! Thank you Nintendo of Europe, thank you! The decision of getting Smash Wii U or Sonic Boom: Rise of Lyric is even harder now. But it still amazing news for us European Smashers. Congrats guys. And despite those who say its only a week, having it circled on your calendar end of Nov has to be better than flippin the page to Dec. So are amiibo Nov 28th too? Japan can wait until Dec, they get Captain Toad Nov 13, same day as the MK8 Wii U bundle, which may have contributed to low Wii U sales of late, some are waiting. Only 7 days to beat Dragon Age I & Sonic Boom? Challenge accepted . DAAAMN! The original date worked well for me. To be honest this makes the one week delay on Pokemon even more annoying. At least it avoids the awkward having Amiibo out for one week and nothing to use them on. I'm guessing Japan isn't under the same 19 days to Christmas shopping pressures as the west is? So instead of delaying games, they do it the other way around now? You are really unpredictable, Nintendo. Jokes aside, congratulations, Europe. The least waiting for Smash, the better. Hooray! Now all we need is for ORAS to come out to Europe on say days America is getting it. That would be a miracle. The opposite of game delays! Great. NOW I HAVE TO DECIDE ON EITHER POKEMON OMEGA RUBY OR SMASH BROS. THIS DECISION IS MUCH MORE DIFFICULT AND CONFUSING THAN INTENDED. @Starwolf_UK It's probably a good thing Europe doesn't get ORAS on the 21st as far as the eShop server goes. The eShop will probably crash anyway though! Anyone remember the disaster that was last Christmas? Anyone? Just me? My mum? Oh well. A week isn't really a big deal. And the West gets ALOT of Wii U stuff before Japan. It is console related so.. Remember the Wii U itself released later in Japan, so that's not really anything new. Nintendo bring a release date forward? But...what the? Was this in Nostradamus? I dread to think what's next-human sacrifice, dogs and cats living together, mass hysteria! I was a bit annoyed at first that we were getting it so late in Australia, but I got over it pretty quickly since we're still getting Omega Ruby/Alpha Sapphire more or less on time and i've got the new 3DS XL on preorder. Still, glad to hear they've closed the gap a bit. YES! I just hope Amazon update it so it gets delivered then as I've already ordered it. If only the cover of the game was like that picture with all the characters...that looks so cool!